6 movies to stream if you loved "The Big Sick"
When we think of Oscar-nominated movies, we don’t think of romantic comedies. Sweeping epics, sure. Historical dramas, most definitely. Sometimes even a movie musical makes the cut. But romantic comedies? The Academy shows no love, in part because the rom-com rarely feels true. Enter The Big Sick. In 2017, the based-on-real-life love story stole the hearts of critics — and audiences — everywhere with its quirky but relatable premise and humor. 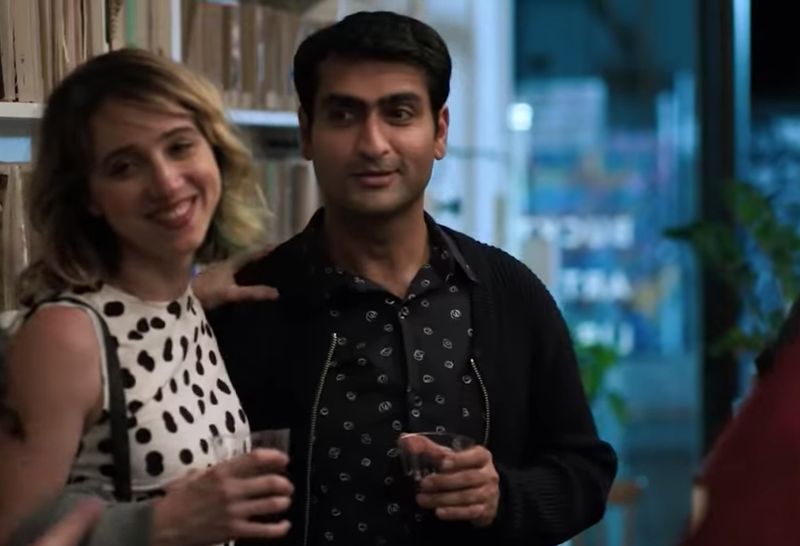 Starring Kumail Nanjiani and Zoe Kazan, the heartwarming flick follows a young couple as they navigate everything — from cultural clashes to feisty family members and life-threatening illness — in order to keep their love alive. The result: a funny, messy, serious, and silly rom-com even Oscar can love. In fact, The Big Sick is up for the Academy Award for Best Original Screenplay. Its chances of winning are only about 50/50, but we’re holding out hope. And in the meantime, maybe we’ll make like Kumail and Emily’s parents and wait it out by watching movies. In the vein of The Big Sick, natch. Back in 2002, this sleeper hit (also nominated for Best Original Screenplay) became the highest-grossing romantic comedy of all time, raking in over $240 million in North America alone. A cross-cultural love story a la The Big Sick, My Big Fat Greek Wedding stars Nia Vardalos as Toula Portokalos, a Greek-American woman whose traditional family insists she marries a good, Greek man. But when Toula brings home white-bread fiancé Ian Miller, all hell breaks loose. Opa! At first blush, Obvious Child may not seem like an obvious choice for this list. But it’s certainly the right one. Written and directed by Gillian Robespierre, Jenny Slate stars as Donna, a struggling stand-up comedian who has a drunken one-night stand with a man named Max after she breaks up with her boyfriend. An unwanted pregnancy results, and Donna decides to have an abortion. But if you’re in the mood for a sugary sweet sob story, let us stop you right there. Like The Big Sick, it’s Obvious Child‘s bold choice to find the humor in a very real situation that makes the film so damn special. Meet Marion. A Paris, France-born photographer, she lives in New York City with her neurotic hipster boyfriend, Jack. Desperate to reignite the passion in their loveless relationship, the pair take a trip to Europe and stop over in Marion’s hometown to visit with her hilariously unapologetically French folks. Think a classic culture-clashing couple’s comedy, but with way more nuance. Particularly with Julie Delpy’s turn as the smart, confident, and complicated woman (with agency) at the center of it all. Perhaps Delpy drew inspiration from her own badass self to bring Marion to vivid life — she not only stars in the film, she also wrote, directed, produced, edited it… and composed the soundtrack! If you love 2 Days in Paris, get ready. 2 Days in New York picks up some five years later. Marion stills lives in New York, but she and Jack have split. She’s married to Mingus now, a hip talk-radio host played by Chris Rock. But when Marion’s unwittingly racist and sexually frank French family come to town, the couple’s quiet, cozy life turns chaotic real quick. But can their love survive their families? How do you say relatable AF, en Français? Imagine you’re a successful male novelist, but you’re crippled by writer’s block. Your therapist suggests a simple and straight-forward writing assignment to unstick: write about someone who adores your dog, and best friend, Scotty. Inspired, you start to dream up an enchanting young woman named Ruby Sparks. She’s everything you ever wanted a woman to be. Until she’s real. Like, living-in-your-house real. And now, she wants her own life, her own dreams, to make her own choices, and DAMN, THIS IS NOT AT ALL WHAT YOU THOUGHT IT WOULD BE! Written and starring The Big Sick‘s Zoe Kazan, Ruby Sparks turns the tired Manic Pixie Dream Girl trope on its head in this dream of a clever, deconstructed romantic comedy that will make you fall in love with it, flaws and all. Happy streaming, Big Sick lovers!